Bantwal, Nov 28, 2017: Hundreds of enthusiasts witnessed the Veera-Vikrama Jodukare Kambala held at Hokkadigoli near Siddakatte in Bantwal taluk. A total of 98 pairs of buffaloes took part in the event which was held in different categories namely Negilu Hiriya, Negilu Kiriya, Hagga Hiriya, Hagga Kiriya, Adda Halage and Kana Halage. Kambala Samithi President Nonaluguttu Rashmit Shetty, Honorary President Sanjeeva Shetty Gundyaru, Honorary Advisor Suresh Shetty and others were present. 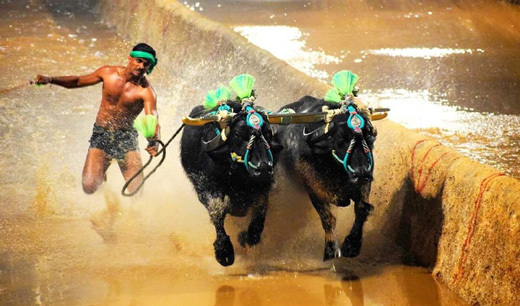 The Kudos are happy as the DSc has given the consent to organize Kambala.